Java Arts’ new exhibition ‘QuickDraw’ is exactly that: a collection of short comic art vignettes by ‘Jinja’ (AKA John Weeks) in English and Khmer. You’ll see observations on daily life as well as musings on larger issues of living in the Kingdom, garnered over a period of 10 years. Copies of a 30 page color comic (also bilingual) will be available for sale and signing by the author. The opening is Wednesday the 18th, 6:30 pm. 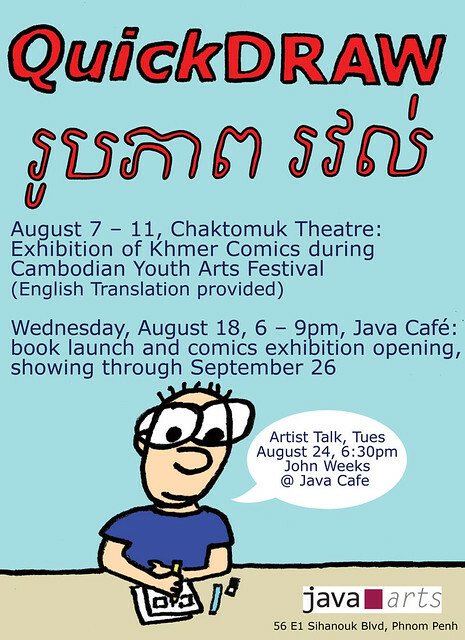 In addition to the exhibition, an artist talk on Cambodian comics history (‘50 Years of Cambodian Comics‘) will take place on the 24th (in English) with emcee John Berkavitch. All are welcome to learn about this little known chapter of Cambodian art history. Postscript: a few launch pictures. More to come! @azzamckazza:@comicslifestyle This needs to be recorded. Get TootlegBoy and D-Rock Blumenshtein on to it. Conversation in Jakarta with Athonk, May 2000. I was actually proto-blogging back then! Super old archival Athonk page. http://fade.to/pureblack This is the last one online; I used to have numerous comics profile pages for my pals but everyone’s got a blog or site of some sort now – most are in the sidebar on ComicsLifestyle.com. 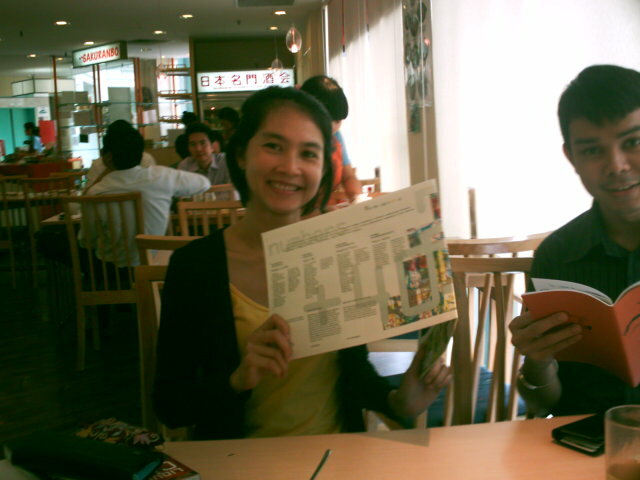 Did an informal presentation @ Hackerspace.sg today on Cambodian comics and web comics. I ran through some basics on Khmer comics (primarily using the powerpoint presentation from my talk at BICOF) and am starting to develop some notes for a general presentation on webcomics: how I use ‘em, what they’re good for, where they are going. Possibly for the next BarCamp I attend. OK, here’s a short video tour around the venue now that everyone has left. Postscript: Preetam's writeup of the talk.